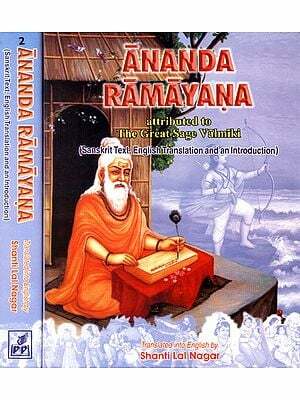 Adhbut Ramayan authored by sage Valmiki, who is famous for his classic epic ‘Ramayan’. Describes a highly strange, mysterious and fantastic version of the epic story of Lord Ram, the legendary king emperor of Ayoydhya and an incarnation of Lord Vishnu, the supreme Lord in creation. It reveals many hitherto little known events in the life of Lord Ram and his divine consort Sita which Valmiki knew but desisted from incorporating them in his earlier epic. He wrote this classic work ti fill that gap and put the record straight. This classic book can be broadly divided into two parts. The first (canto 1-16) elaborately describes some mysterious and strange circumstances pertaining to the birth of Lord Ram and Sita; it also contains profound Vedanta philosophies when Sri Ram preaches Hanuman about them. the second part (canto 17-27) presents the story of Sri Ram’s campaign against the thousand headed demon king Ravana of Pushkar who was the elder brother of the ten headed Ravana of Lanka, and much stronger and powerful than latter. In this war, Sita assumed the form of mahakali, the dar-skinned Goddess worshipped as Shakti, to slay this Ravana and his demon force. The demon army has been described in great detail. 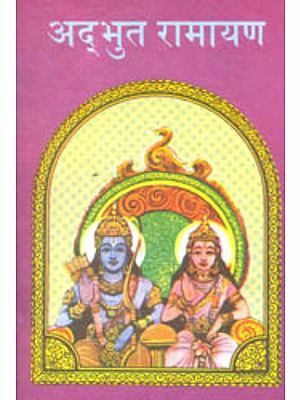 The climax of the book and the aspect which makes it so unique and holy is when lord Rama prays to the cosmic Goddess or Shakti uning 1008 divine names or mantras which describe and enumerate the various glories virtues and attributes of the magnificent Shakti of Mother Nature. This is the only classic Composition where the Shakti has been worshipped using there profound mantras. This volume describes the text in great detail, incorporating commentary explanatory & relevant notes when required. An elaborate life sketch of sage Valmiki incorporating numerous little known facts about him, have been included to give a special unique flavour to this book. Besides this, important metaphysical concepts appearing in the text have been explained in a separate appendix. Ajai Kumar Chhawchharia born on 8th August, 1955 in Burdwan district of West Bengal, is a humble and unpretentious bachelor, who has dedicated his entire life to the service of Lord Ram. At present he is residing in the holy pilgrim city of Ayodhya (U.P. India) since 1985. Sage Bharadvaja asked seer Valmiki, ‘Ramayana is said to be spread in hundreds of thousands of verses. Out of them, twenty five thousand versions are available here on this earth. Out of these, please be kind to tell me that story which is most secret, magnificent, mysterious and hitherto undisclosed and unknown in this world’ (canto 1, verse nos. 2½, 4, 5½ ). Valmiki replied, inter alia, ‘Oh Brahmin! Listen carefully to the great and glorious story related to the worldly deeds done by the heir of the Kakutstha clan (i.e. Sri Rama) in which the stupendously glorious and fascinating deeds done by Sita, who was a gross manifestation of the subtle primary, eclectic, ethereal energy and sublime force of creation, which are robust, vigorous and effective and called Mother Nature or ‘Prakrti’, assumes a preeminent role’ (canto 1, verse no. 11). ‘Adbhuta Ramayana’, as the name suggests, describes the most strange, wonderful, mysterious and awe-inspiring fascinating story of Ramayana, the chronology of the fantastic worldly deeds done by Sri Rama and Sita, who were manifestations of Lord Visnu and his divine consort Goddess Laksmi respectively on the earth to get rid of evil forces personified by the demons, which was hitherto unknown in this world. It is a strange and mysterious story, quite different from the general perception about the story of Ramayana in which Sri Rama is the main hero and he occupies the central stage throughout the epic. This is the story where Sita, who was not only the manifestation of Goddess Laksmi and a divine consort of Sri Rama but also of the primary forces of and energy responsible for creation, collectively called ‘Prakrti’ (Nature) and ‘Maya’ (deluding powers of Nature), plays a prominent role. The story revolves around Sita more than it does around Sri Rama, and it seeks to establish the greatness, the valour and courage, the strength, powers and potentials, the glory and majesty of women and womanhood which are traditionally so much adored, admired, honoured and praised in India more than men and manhood. It is the ‘mother’ who really takes care of the world created by the father; it is Sita who provided succour and restored peace in the world when she finally killed the thousand headed Ravana of Puskara, who was the elder brother of the 10-headed Ravana of Lanka and equal number of times more powerful than his younger sibling, even though Sri Rama failed to subdue and vanquish him. It was Sita who finally overcame this great demon, restored peace on this earth by eliminating the scourage of all evil mongering demons representing vices and perversions on this earth. It was she who forcefully restored the balance in favour of righteousness and auspiciousness by eliminating all inimical forces that came in the way of righteousness and virtuousness. The story of triumph and tragedy unfolds in 27 Cantos, and is an unconventional depiction of the epic story of Ramayana in various aspects. For one, it does not have the standard pattern of 7 ‘Kandas’ or Chapters of the conventional Ramayana (which are Bala Kanda, Ayodhya Kanda, Aranya Kanda, Kiskindha Kanda, Sundara Kanda, Lanka Kanda and Uttara Kanda). Rather, it is divided into 27 Cantos forming one homogenous text. Second, the reason why sage Narada cursed Visnu has been elaborately dealt with, as is the story of king Ambrisa who was one of the ancestors of Lord Rama (Canto 1-4). Third, Sita’s birth has been described in great detail and it establishes, most unconventionally again, that she was an immaculate conception of Mandodari, the wife of 10-headed Ravana. 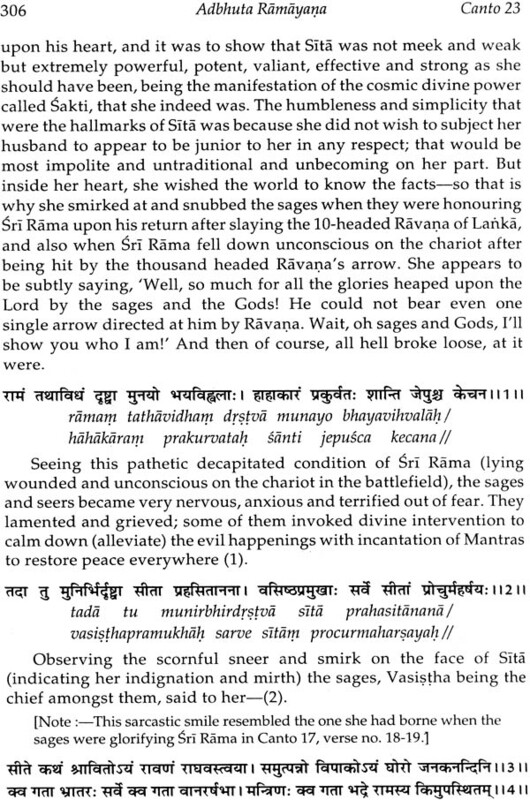 This particular episode of Sita’s strange birth gives a real mysterious twist to the generally held view about the birth and parentage of Sita, but a careful reading will dispel all doubts of any wrong doing or occurrence of any unrighteousness pertaining to her birth (canto 8). Earlier, the story describes why and how sage Narada had cursed Laksmi to force her to take birth as Sita and become the daughter of Mandodari, the wife of the 10-headed Ravana (canto 5-7). 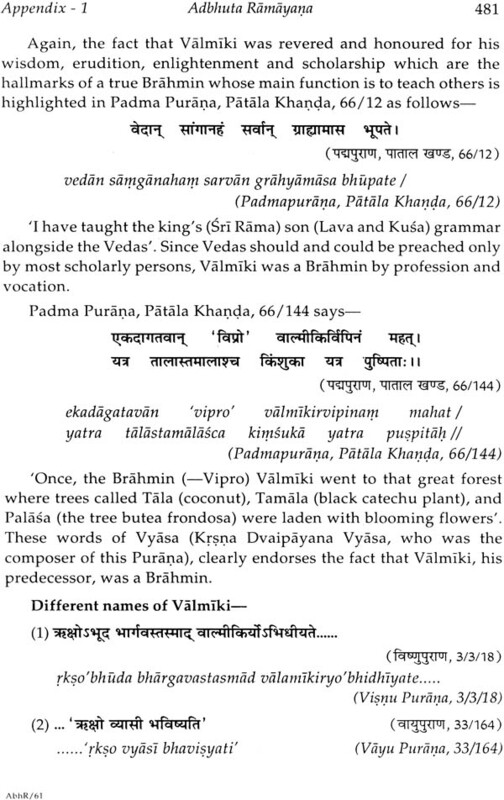 Next we find that the author of the epic, sage Valmiki, has skipped all other events related to Sri Rama’s childhood, his going with sage Visvamitra to protect his fire sacrifice, and the marriage of Sri Rama and his brothers with Sita and her sisters at Janakapura. Our story of ‘Adbhuta Ramayana’ comes straight down to sage Parasurama coming angrily for a stand off with Sri Rama when the former learnt about the breaking of Lord Siva’s bow, called ‘Pinaka’, by Sri Rama, and which was a condition set by Sita’s worldly father Janaka for her marriage. He met the marriage party while it was on its way back to Ayodhya with the brides. Sri Rama confronted the sage boldly, vanquished his haughtiness and his sense of superiority as a vanquisher of the Ksatriya clan (verse nos. 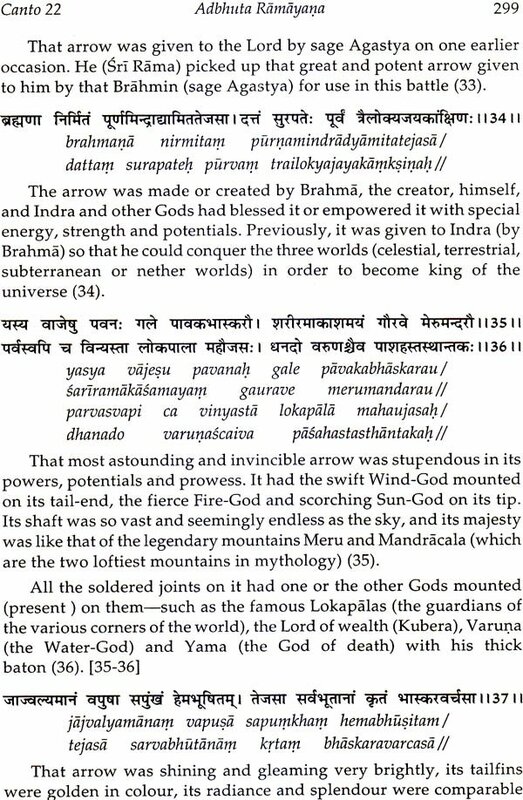 10-16); Sri Rama then showed the sage his ‘Virat form’ which was the macrocosmic, all encompassing divine and colossus form of the supreme Lord of the cosmos (in verse nos. 17-20½). The sage’s ‘Teja’ (the divine energy, strength, powers and potentials which he possessed), which was given to him earlier by Lord Visnu, was snatched by the Lord, and the crest fallen sage was advised by him to go and do severe penances and austerities to recover them. All this is covered in canto no. 9. Moving ahead with the fabulous story, we find that once again the narration jumbps straight to Sri Rama meeting Hanumana and showing his 4-armed vision of Visnu in canto 10. 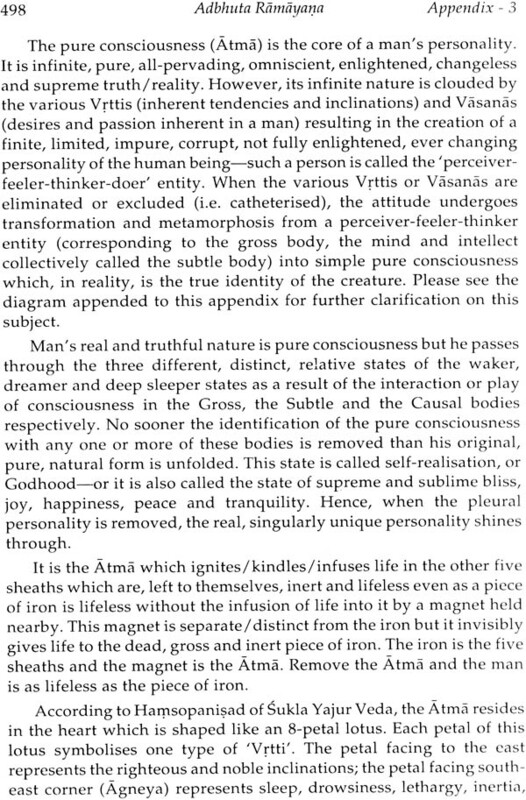 This, in conjunction with the Virat form shown to Parasurama in Canto 9, completes the depiction of Sri Rama’s true divine form as the supreme Lord of creation. 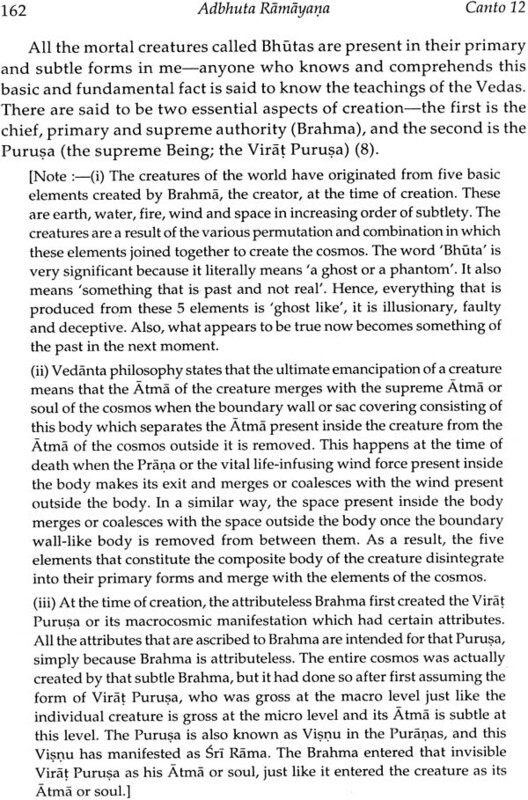 Then the discourse between Sri Rama and Hanumana follows, which expounds on the philosophy postulated and propounded by Vedanta relating to the Atma/soul, Brahma, the elements called ‘Bhutas’, the creatures, their interrelationship with each other, the concept of ‘Moksa’ (liberation and deliverance, emancipation and salvation etc.) in canto nos. 11, 12 and 14 The concept of ‘Bhakti’ (devotion, faith, reverence, allegiance, submission and surrender to the supreme Lord by his devotee) is also elucidated in detail in canto no. 13. These four cantos (nos. 11-14) have a high element of spiritual quotient and contain almost all the principle tenets of the Upanisads presented in a succinct manner. 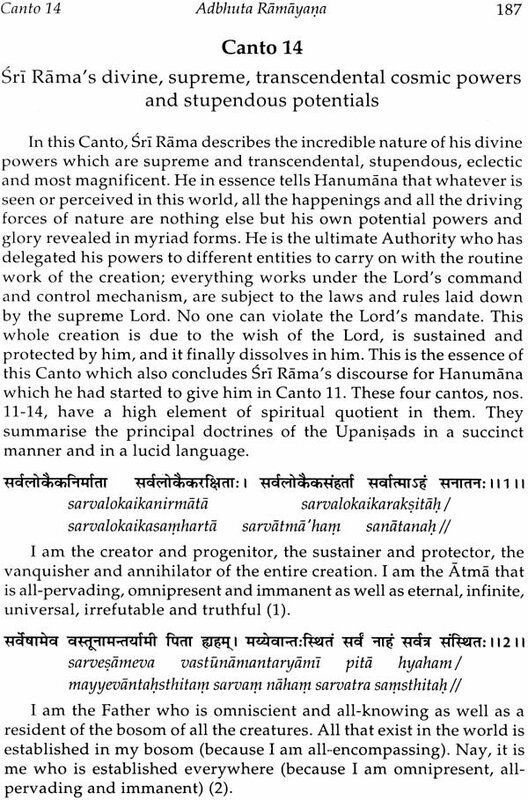 Realising the true form of Sri Rama as the supreme Lord personified and manifested as a human, Hanumana praises him and prays to him in canto 15. The entire episode of Sri Rama crossing the ocean, defeating and slaying the 10-headed Ravana at Lanka and coming back to Ayodhya to be crowned king have been summed up in merely 20 verses of canto 16 to emphasise the point that the main thrust of this ‘Adbhuta Ramayana’ is not to repeat what is the already known story of Sri Rama, a story which highlights and glorifies Sri Rama’s victory over the king the Lanka, but to emphasise the point that something more formidable was still to be achieved by the divine couple. A greater, many times more powerful and invincible enemy in the form of the thousand headed Ravana of Puskara still existed, and unless he was vanquished, the real glory of the divine couple Sri Rama and Sita would not have reached its pinnacle. So we move on to the second half of the story. The real fascinating story of Adbhuta Ramayana starts from canto 17 when Sita informs the royal court of Sri Rama, attended by great sages and seers who had assembled there to congratulate and honour Sri Rama for his victory over the Ravana of Lanka, about the existence of a superior enemy in the form of a thousand headed Ravana who ruled at Puskara, and who was the elder brother of 10-headed Ravana of Lanka. She tells the assembly how she had come to know about him. This inspired Sri Rama to launch an audacious campaign against this formidable enemy. Canto 18-22 describe the ferocious, no-holds-barred war between the two, Sri Rama and the thousand headed Ravana of Puskara, which ultimately lead to Sri Rama being defeated and gravely wounded and lying unconscious in the battlefield in canto 22, verse nos. 48-50. There was a terrible cry of distress, grief and dismay amongst and Gods who panicked when Sri Rama fell. At their urgent appeal, Sita assumed the most terrible and horrifying form of ‘Mahakali’, the great black goddess of death and destruction. Canto no. 23 describes her killing of this formidable and ferocious demon, along with his sons and army, single handedly. At that time, the Goddess Mahakali had danced the ferocious and most terrifying ‘dance of death’ which sent chill down the spine of all the Gods as well as the sages and seers who feared that the creation would be annihilated by her wrath. The eerie description of the battlefield is really spine and bone chilling, and it vividly describes a scenario that is reflective of the view of the landscape, the horrendous occurrences, the horriying, blood cuddling bloodshed and mayhem that occurs during an annihilating war of destruction and death. This canto describes how the divine cosmic force of Nature was unleashed by the Lord when all other more conventional means of eliminating evil, pervert and sinful forces from this earth proved futile. When conventional steps were not sufficient, drastic measures were taken by Mother Nature. In order to calm Sita down, now in her fierce, vicious and relentless form as Mahakali, the Gods, lead by Brahma who is the patriarch of creation, prayed to her most humbly and assured her that Sri Rama would soon come back to life and regain his consciousness. This is described in canto no. 24. When Sri Rama finally regained his consciousness, he was stunned to see the terrifying form of Mahakali and was terrified on observing the haunting scene of death and destruction laying strewn all around him. When asked who she was, Sita, as Mahakali, described and showed to Sri Rama her true form, which was the stupendous, glorious, majestic and colossus form of the cosmic Goddess who is the ‘boss’ of all that exists, in canto 25, verse no. 5-14½. This held Sri Rama awed and spellbound. Then follows the marvelous and fascinating Stotras or hymns in the praise of the Goddess. Sri Rama prayed to her, brimming over with devotion and reverence, with these Stotras and he worshipped the great Goddess in her majestic, macrocosmic, divine, sublime and subtle manifestation as the Goddess of the universe. 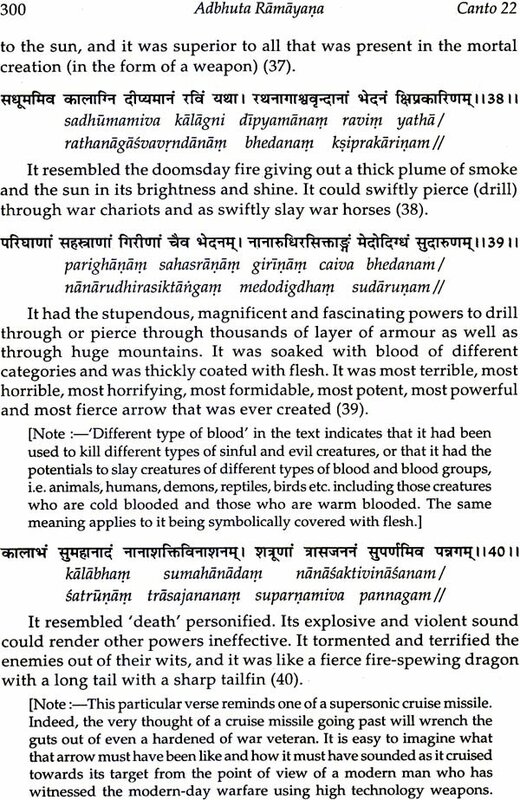 These hymns essentially take the form of ‘1008 names’ of the Goddess which are the different adjectives or epithets or metaphors used to describe the different virtues, glories and attributes of the cosmic Sakti which has manifested itself in the form of Mahakali in the battlefield of Puskara. She is the stupendous force and energy primarily responsible for creating, unfolding, sustaining, enhancing, developing, regulating and finally concluding the entire creation, the forces which are so stupendous, so powerful and potent that they accomplished what Sri Rama, who was himself an incarnation of Lord Visnu and who was a manifestation of the Virat Purusa, could not do himself with all the strength, powers, potentials and authority that he had at his command. All the unaccomplished task of getting rid of evil forces from this earth which Sri Rama could not do himself were done by Sita in her manifestation as Mahakali. What Sri Rama could not do after fighting fiercely with the thousand headed Ravana for a longtime, was done by Sita, as Mahakali, within a short span of time. In fact, the entire canto no. 25 is dedicated to these magnificent hymns called Stotras, and is unique in the sense that it is the only text which sings the glories of the great goddess, the mother of creation, the divine female aspect of creation, using a wide swathe of metaphysical concepts extending from the gross to the most subtlest. I have tried to explain all these 1008 words with their simple meaning and implication to add beauty, succulence, life and vibrancy to this epic story of Adbhuta Ramayana. This pure metaphysical form of worship is followed by a spiritual and devotional form of prayer in canto no. 26. These two cantos (no. 25 and 26), read with cantos 9 to 14, mark the pinnacle of the spiritual glory of this Adbhuta Ramayana. Pleased by Sri Rama’s prayer, Goddess Mahakali sheds her horriying and terrible form, and she calms down to her original form of the pleasant looking, benevolent, charming, docile, gentle and sweet form of Sita. The Gods celebrated the occasion by beating kettledrums and showering flower as Sri Rama and Sita prepared to come back to Ayodhya from Puskara after vanquishing and slaying the thousand headed Ravana, thereby removing the lat hurdle to world peace. The final canto no. 27 describes Sri Rama’s arrival at Ayodhya and his bidding good bye to the monkeys and demons (the companions of Sugriva and Vibhisana respectively who had earlier been invited to join the campaign against the thousand headed Ravana). 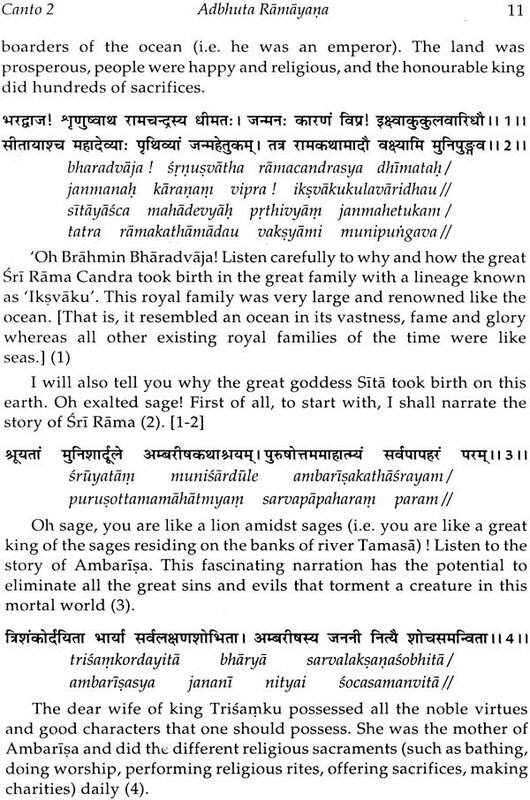 Sage Valmiki concludes the narration by describing the genesis of this special version of Sri Rama’s story (verse no. 19-22) and lists the benefits of hearing and reading it (verse no. 14-18, 31-32). A summary of the whole story is also included by Valmiki himself at the end of canto no. 27, in verse no. 23-30, as an epilogue. This Adbhuta Ramayana is also called ‘Adbhutottara Kandam’ as is clear from canto 27, verse no. 19. this means that this story is the most excellent, the most amazing, the most mysterious narration of the deeds done by Sri Rama and Sita which are very fascinating and strange as well as extremely marvelous and magnificent in their reach and import. The ‘mystery’ aspect and the ‘secrecy’ of the episodes narrated in this Adbhuta Ramayana called ‘the Adbhutottara Kandam’ had been maintained all along till they were narrated and made public by sage Valmiki to sage Bharadvaja, for the simple reason that when Mahakali assumed the fierce form of the naked Goddess of death and destruction to kill Ravana, none of the members of Sri Rama’s army was present there on the battlefield at the time, and even he, Sri Rama, lay unconscious. 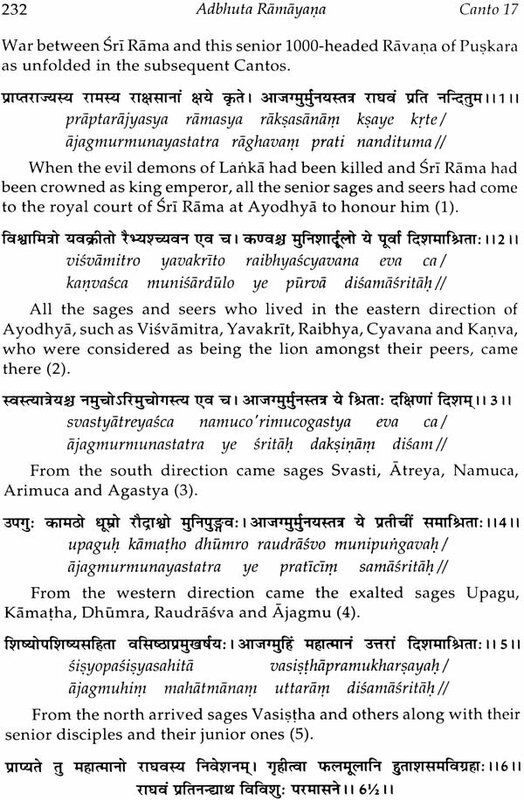 So, though Sri Rama narrated the events when he came back to Ayodhya to his friends as described in canto 27, verse no. 4, he could not describe to them the exact sequence of events which unfolded on the battlefield after he had lost consciousness and before he regained it. The actual killing of Ravana by Sita in the form of Mahakali and her subsequent naked dance of death and annihilation on the battlefield, accompanied by innumerable other evil spirits of war also dancing with her in their naked and ferocious forms, was not known to Sri Rama; he was honestly unaware of them. None of the humans, monkeys and demons who had accompanied Sri Rama on the compaign were there to see those events either. They could not imagine how Sita had assumed the horrifying form of Mahakali playing around with severed skulls as if they were balls, romping and stomping around with blood soaked naked black body, covered with garlands of skulls, blood dripping all over, holding a wildly swaying sword drenched and dripping with blood, with ferociously burning eyes spouting vehement anger and wrath, with blood dripping from her protruded tongue like flames of fire giving out sparkles from the midst of blood-drenched sharp fang-like teeth, howling and prancing, yelling and screeching madly and frantically in the battlefield over corpses, tearing at some of them with her bare incisors and clawing at others with sharp pointed nail! Further, the way Sri Rama prayed submissively to the Goddess after he had regained consciousness after his humiliating defeat at the hands of the thousand headed Ravana, would not have gone down well with his subjects. They adored Sri Rama as their great King Emperor who was very powerful and invincible, courageous and bold. Just imagine what they would have thought had they known that the Lord whom they adored and lauded so much had been made to bite the dust of the battlefield when faced by a strong enemy. This made the story most unacceptable and unconventional for the mass’s general consumption. All these events as narrated in this epic ‘Adbhuta Ramayana’ had been omitted by Valmiki in his other epic story of Sri Rama, the well known ‘Ramayana’, because it would not have done well to the glory of the emperor that Sri Rama was and his followers would have lost their confidence in him. So he (Valmiki) decided to keep it under wraps and keep quiet for the moment while he was writing the other epic Ramayana, but later on when Sri Rama’s sojourn in this world had come to an end, the sage decided to reveal the hitherto hidden and unknown facts for the benefit of mankind to make the record straight. He decided to undo the injustice done to the depiction of the ‘real story’ by presenting this ‘sequel to the epic Ramayana’s in the form of this present book called ‘Adbhuta Ramayana’ which essentially glorifies Sita instead of Sri Rama. Another important point is that this Adbhuta Ramayana focuses on Sri Rama and Sita alone, bypassing all other characters associated with Ramayana, relegating them to the background, or not mentioning them altogether-such as the brothers of Sri Rama, the monkey king Sugriva and the demon king Vibhisana etc. even Hanumana, who is a great comrade-in-arm of Sri Rama in all other versions of Ramayana, has no roe at all to play in the battle with the Ravana of Puskara. Instead, the text lists the individual names of all the warriors and commanders of the army of the thousands headed Ravana as mentioned in canto 18, verse nos. 43-52, 59-70, as well as his sons as listed in canto 19, verse nos. 2-19, besides describing in detail their forms and demeanours in canto 18, verse no. 53-58 and canto 19, verse no. 10-33. A general question that rises in the mind is why Sri Rama behaved like an ordinary human being if he was the supreme God? Valmiki has answered this question in canto 4, verse nos. 60-81. I have appended my own notes to the verses to amply clarify the points and leave no doubts in the mind. Thus we see that ‘Adbhuta Ramayana’ or the ‘Adbhutottara Kandam’ as it is named by Valmiki himself in canto 27, verse no. 19, is a most fascinating and marvelous but unconventional rendering of the great story of Sri Rama highlighting those spectacular events, those episodes which are mysterious and strange to hear, along on the edge of incredulity. It was a closely guarded secret kept with Brahma, the creator and patriarch of creation, who first divulged it to Narada, the celestial sage, and from him sage Valmiki came to know about it; this is clearly mentioned in canto 27, verse no. 20. It was first described by Valmiki to Indra and then to Bharadvaja, the present listener of this beautiful story; this is mentioned in canto no. 27, verse no. 19. Sri Rama’s story is most charming and fascinating while being spiritually elevating at the same time. For this humble author, Sri Rama is his entire being, the purpose of existence, the means of existence and the end of existence. Even as a seed will sprout into a new flowering plant no matter which side of it is facing down or up, the contentment and peace, the happiness and joy, the sense of fulfillment and accomplishment derived from describing the Lord’s story is indeed most uplifting and elevating for one’s spirit. I have introduced each canto with an outline synopsis of the main theme in it. The introductory synopsis will also help to link the particular canto with the general story of Ramayana, and prepare the reader to enjoy the text better. It would be pertinent to learn about who the author of this epic story, sage Valmiki, was. So I have included an elaborate appendix no. 1 which would quite exhaustively present a comprehensive picture about this great and enlightened sage, a wise and erudite seer, an accomplished hermit and ascetic who was one of the greatest scholars that ever walked on this earth, i.e. the great sage Valmiki. Numerous fascinating facts about him have been presented with citations from the Vedas and Puranas and other texts that not only tell us about his early life but also bring out the fact that he was a great narrator of the Puranas and a classifier of the Vedas also. Incidentally, appendix no. 2 has a fascinating ‘Sukta’ from Rg Veda supposed to have been written by sage Valmiki in his incarnation as the 24th Veda Vyasa. I hope that these two appendices would be very informative for the reader. I most sincerely, honestly and from the deepest recesses of my heart thank Shri Navneet Das Gupta Ji of Chaukhamba Surbharati Prakashan, Varanasi, for holding this torch illuminating the divine glories of Sri Rama as sung by the great and enlightened sage, the wise and erudite seer Valmiki, by publishing this great epic known as ‘Adbhuta Ramayana’. Not everyone gets a chance to serve the Lord. The Lord picks and chooses them carefully, and like the apostles of Jesus Christ, they who are selected by Him to render service to Him are indeed most fortunate and privileged. Indeed, therefore, Shri Neeraj Gupta ji deserves a standing ovation for being selected by the Lord for this great honour. Mere thanks on my part will be insufficient to express my deep sense of gratitude to him to get this book published. In fact, this narration has been inspired by the Lord himself, my fingers being only instrumental in holding the pen as it flowed on the paper. Therefore, all the credit goes to Sri Rama while I might be forgiven for the errors of omission and commission, of transgression and impertinence, as I am an ordinary human being with a bag full of my limitations and incompetencies. The credit also goes to Hanuman whom I revere as my moral preceptor and protector without whose support any work relating to Sri Rama remains unsuccessful and unaccomplished. And, finally the credit goes to Shri Neeraj Gupta ji of Chaukhambha Publishing House, New Delhi for enabling this flower to blossom in the form of a book. I hope the reader will enjoy the text inspite of my shortcomings and would marvel at the greatness of this story and the fascinating mystery of the revealed tale aptly titled ‘Adbhuta Ramayana’ or ‘Adbhutottara Kandam’.